DLB rugs and carpets on display at Kips Bay Decorator Show House! This year’s show is taking place at the Villard Houses at Madison Avenue and 51st Street, and we are so pleased to have our lovely textiles included in this outstanding, charitable exhibit. The show house event started in 1973 and supports the Kips Bay Boys & Girls Club. On Wednesday, the New York Times had a write up of this year’s showcase that includes a history of the annual rotating exhibit. If nothing else, check out the slideshow, this year’s featured designers have crafted a jaw-dropping assemblage of daring and decadent spaces: Ron Arad’s massive, million-dollar steel sculpture “fire screen” (peek through the grate and you’ll see a video of a fire) rests in a sitting room, Matthew Quinn built a 600-pound range hood made of crushed marble and limestone for the kitchen, and Darryl Carter altered a trio of 19th century paintings, ripping a landscape out of its frame and smearing white paint over the mouths of a pair of portraits, for a living room. Truly, this stuff should be seen in person. Here’s a look at some of the rooms featuring our rugs and carpets. Read more: DLB rugs and carpets on display at Kips Bay Decorator Show House! A bevy of Blues or a flair for some Drama? From rich, saturated colors like navy and indigo to bright, vibrant shades like peacock blue and cobalt, blue will continue to reign supreme in the coming year. Navy is heavily present on the runways, on the streets, in editorials and in chic interiors. Tribal patterns in blue will present itself among elegant tapestries, carpets, bedding and decorative pieces will bring a certain richness into home décor. Its beauty rivals Pantone’s color of the year, Radiant Orchid, although its energy is slightly more subtle. Rooms that feature this color will spark creativity and feel embracing to those who enter. Transforming any room with this color would recharge that whole area of the home, whether its created through the use of paint, wallpaper or pieces of art that incorporate it. Read more: A bevy of Blues or a flair for some Drama? You know the kind of décor I’m talking about. It pops up in my design feed all the time. If it’s a “masculine” room, there’s inevitably dark leather, maybe a rough textured floor and some dead animals (or faux dead animals) tacked to the walls. This is the manly-man room; you can imagine a gentleman with a full beard and a smoking jacket settling into it with his pipe. The ladies’ version is no better. There’s usually a lot of pink or purple and an over abundance of floral patterning. Femininity is conflated with girlishness. The person I imagine living in these spaces is someone who gets carded every time she tries to buy alcohol. Maybe she’s not even of age! Today, much of Victorian-era design would be considered “feminine” based on our contemporary standards. The gendering of commodities isn’t the product of ancient legacy; it’s more of a tricky marketing thing. In fact, it wasn’t even until the middle of the twentieth century that pink became strongly associated with femininity. Our ideas about gender and identity are fluid, so organizing an aesthetic around gender is unlikely to render a timeless result. Further, not many of us permanently inhabit a one-gender environment or socialize in a one-gender world. It’s fine and fabulous for a person – of any gender – to like a punchy shade of violet, or to dig dark gray interiors, or to have a thing for baroque flourishes or antlers. But it’s better to ask, “What is it that connects us to those elements?” Than to build a space around a reductive notion of male/female. Here are a few rooms we like that incorporate elements of contemporary “masculine/feminine” design with subtlety and nuance. They are inviting to people, not just men or women. I love this library from the 41st Annual Cathedral Antique Show in 2012. It was designed by Lindsey Coral Harper from Lindsey Coral Harper Interiors . Her jumping-off point for the room was the Eskayel Madagascar rug from Doris Leslie Blau! The Madagascar rug is made from Banana Silk! So if a silk rug is out of your price point, a rug made from Banana Silk will give you that gorgeous silk sheen without breaking the bank. The banana leaf fibers are mixed synthetic fibers that help to accentuate the detail of the design. You can see more pieces made from Banana Silk HERE. The World is waking up to a new record price in the world of Rugs today. A Sickle-Leaf Vine Scroll and palmette “Vase” Technique rug probably Kirman South East Persia $33,765,000 at Sotheby’s NY. Do you notice how this whole rug is like a game for the eyes? What did the rug makers intend? I’m unsure, but this exceptionally fine, yet playful, silk rug hails from China around 1880. The square size of the rug may represent it having been used as a table carpet or meditation rug. It conveys many little stories all within the same frame, using detail, characters, and the muted tones of blues, grays, oranges, and browns. Perhaps the animals depicted even helped anyone who sat on the rug meditate to an even deeper state. Let us enter the carnival of this rug. Fantasy rugs are extremely rare. They’re often silk, and either from Tabriz or Heriz Iran. 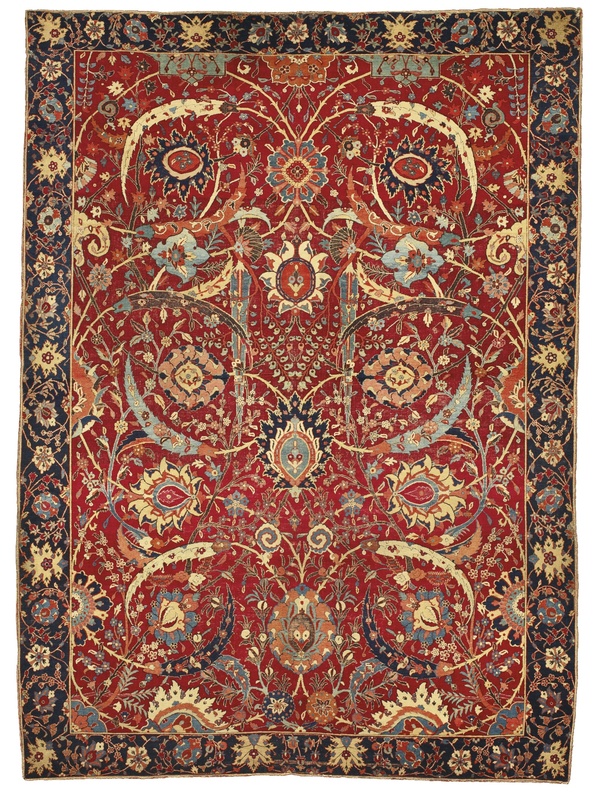 The history of such rugs stems back many centuries, and the quality is outstanding. Production of these carpets ceased around 1900, and they are almost never seen by the public. There are 22 carpets that I have kept to myself over the years. They are all rare, some are priceless, and all of them depict animals. Although I keep them for my private enjoyment, I think it is time I shared some of them with you. Let’s start with the most unusual carpet I have ever seen. Its origin is a mystery. None of the experts, including myself, can explain its colors and design.